Summary: Meeting online friends is always tricky business, especially if you're a Wizard involved in a Muggle roleplaying game. Harry/Draco. My huge thanks to Jen for her quick and astute beta. As noted, I almost never write H/D, but this is for a very special person in my life, Emansil. Rating is PG-13 and is slash. Written for the Harry and Ron Deathly Hallows Slashy Epilogue Challenge. Ultimately Harry/Ron, but not at all explicit. Summary: Reconstructing lives isn't nearly as orderly as rebuilding the world. Epilogue? What Epilogue? genre. At long last, here's my crossover paper, which I'm presenting at Lumos 2006 out in Las Vegas at the end of July, 2006. After writing Of Dwarves and Stewed Lucius and receiving such unexpected responses to it in both the Tolkien and HP communities, I decided to write another survey paper. Please feel free to email me if you have comments. I've been having so much fun with the Ron/Draco drabbles below that when a new community started up, harryron100, I jumped on board. As with the warning below, these do have a variety of ratings so please heed them and skip if you're not interested or if a male/male pairing makes you uncomfortable. began writing these in July, 2006. I've been writing drabbles (100 word exactly ficlets) for a Ron/Draco community. These are slash, so heed that warning. Primarily they're G, but a few go above that, so don't read if you're offended by some strong language and/or m/m relationships. I'll update each week. began writing these in May, 2006. A new friend from The Witching Hour asked for Lavender/Parvati femmeslash. I'm belated, and this has a high angst factor, but isn't explicit. Post-War, Professor of Divination Lavender Brown muses on one aspect of her life that is lost. PG-13. Gapfiller for Half-Blood Prince, visiting a scene Dumbledore mentions in 'Horcruxes' about Snape taking care of him when he returns to Hogwarts after destroying Marvolo's ring. A gift!fic for my friend Amy. Drama and angst. Fun for both fandoms!! A gift!fic for my friend licia. Rating: PG-13 for language, and just figuring what to do when you're in your last year at school. Longish, but not necessarily novel-length: 34,216 wordcount, about 73 pages. A filling-in of The Order of the Phoenix from George Weasley's point of view. What kinds of conversations did they have with their roommates Lee Jordan and Kenneth Towler (and the other 7th-year Gryffindors) while Harry is whining and Ron is trying to figure what's going on? Who did they talk to before securing rent on their shop in Diagon Alley? Backstory for the twins, hopefully adding a 3rd dimension to two HP characters usually given short shrift and fairly flat descriptions. I wrote this over 9 months, and if you've read OotP, I hope you'll appreciate all of the canon references. Feedback most welcome. Now available in easy-to-read pdf format here! Hermione-centric drabble (100 words, exactly) set within the context of The Prisoner of Azkaban. Rated PG-13. Warfic, character death. Ron struggles during the War. First line provided by lyric. Around 450 words. Rating: R, for language and quasi-adult-yet-juvenile content. Pretty hilarious for being so short. Just under 600 words, written for romanticalgirl on LJ. Mere months past Order of the Phoenix, and a follow-up story to "Countdown." 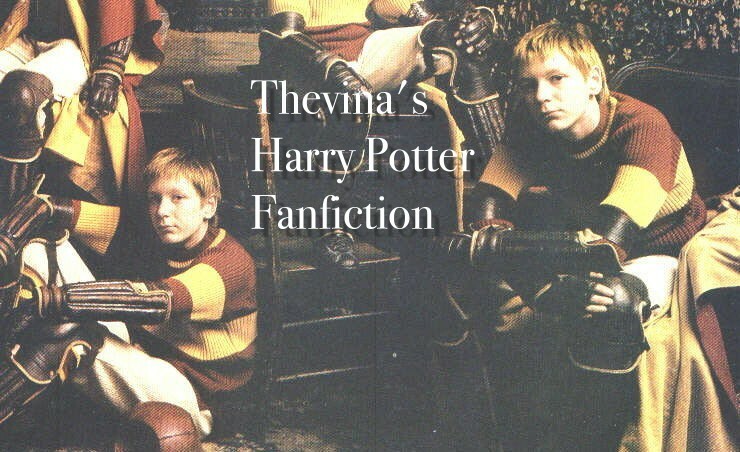 A story about Fred and George Weasley; heroism and anguish. Rated R for language and character death. A Ron/Hermione story set three years post-Hogwarts. A tale of love and loss. Rated R for language and character deaths. My first story, a song-fic. Gap-filler for Order of the Phoenix, Sirius Black/Padfoot's POV. Rating- PG for language.